In January 2015, a trial excavation was conducted at the antiquities site of Ibtin (Southeast; Permit No. A-7305; map ref. 211332/740083). 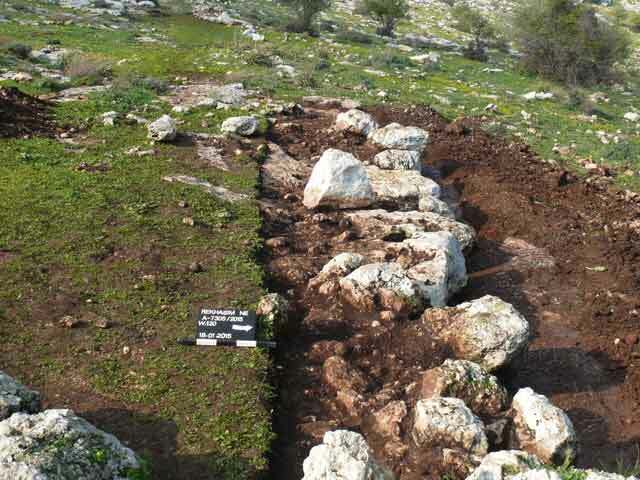 The excavation, undertaken on behalf of the Israel Antiquities Authority and financed by the Cross-Israel Highway Company, Ltd., was directed by A. Massarwa (field photography), with the assistance of Y. Amrani and E. Bachar (administration), M. Kahan and R. Liran (surveying and drafting), C. Ben-Ari and A. Dagot (GPS), A. Gorzalczany (scientific guidance) and K. Saʽid. The site (Fig. 1) is located on a steep hillside southeast of Ibtin, in the southeastern part of the Zevulun Valley. The excavation area was in a rocky slope of a mountainous spur. 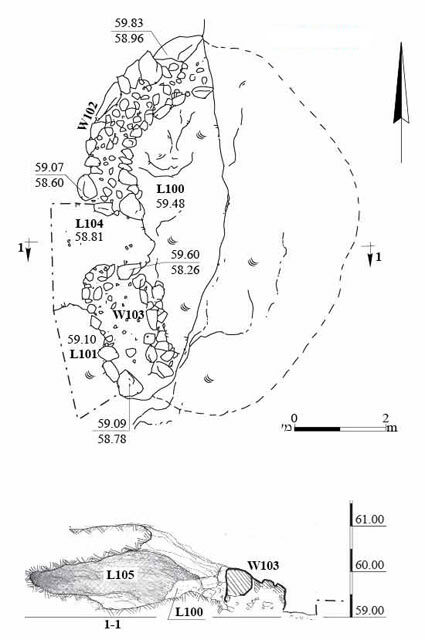 Archaeological surveys and excavations were previously conducted at the site, yielding remains of stone quarries, rock-hewn installations, agricultural terraces and burial caves (Olami and Gal 2004: Site 122). The current excavation was carried out in three areas (A–C; Figs. 2–4). Area A yielded a natural cave (1.7 × 3.1 × 8.0 m; Fig. 2) delimited on the west by two double semicircular walls (W102, W103; preserved height 0.5 m). The walls were built of fieldstones (0.3 × 0.5 × 0.6 m) and founded in part on the bedrock and in part on a bedding of soil and small stones. The entrance to the cave (L104; width 1.1 m) was set between the two walls. It seems that the cave was used as an animal pen. 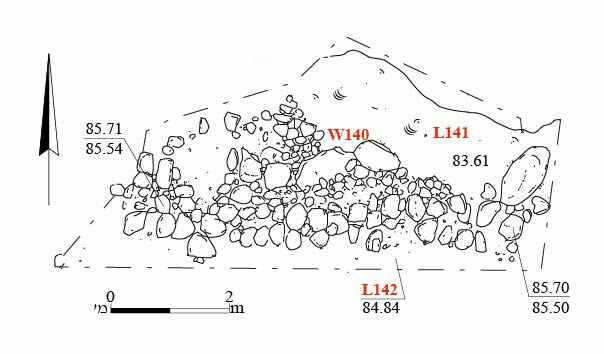 Area B, opened c. 134 m south of Area A, yielded a field wall (W120; length 10.8 m, width 1.8 m; Figs. 3, 5). The wall, founded on the bedrock, was built of roughly hewn stones (average dimensions: 0.5 × 0.6 × 0.7 m) and was preserved to a height of one course. The wall was apparently used to retain an agricultural terrace. No datable finds were discovered. 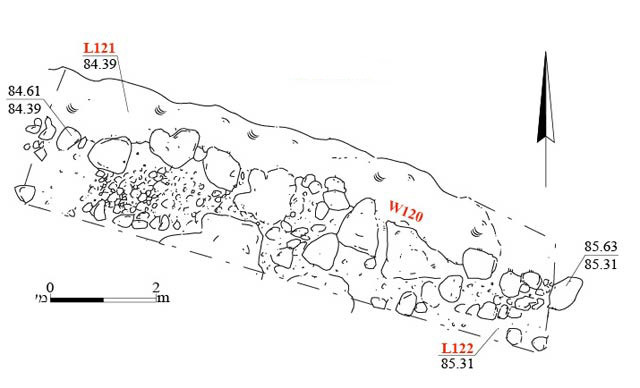 Area C, opened c. 34 m west of Area B, yielded a field wall (W140; length 7.5 m, width 1.6 m; Figs. 4, 6). The wall, founded on the bedrock, was constructed of roughly hewn stones (average dimensions: 0.3 × 0.4 × 0.5 m) and a fill consisting of soil and small stones. The wall survived to a height of one course. It seems that this wall, like W120 in Area B, was part of an agricultural terrace. No datable finds were discovered. 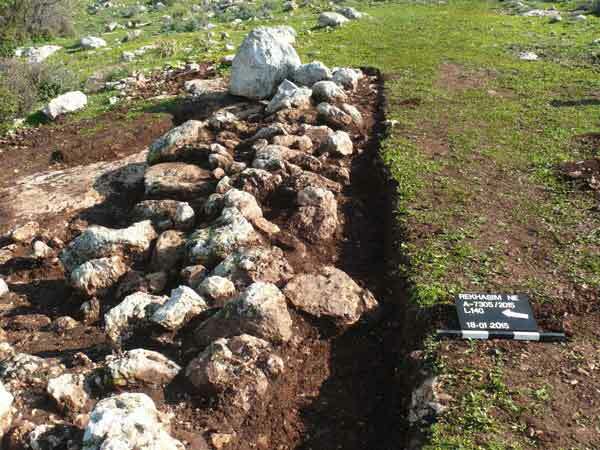 The remains are indicative of agricultural activity, and augment the finds from previous surveys and excavations in the area, which was used for farming from the Middle Bronze Age until the modern era (Olami and Gall 2004: Site 122). The excavation was evidently situated in the agricultural hinterland of an ancient settlement, whose remains are currently located within the precincts of the village of Ibtin. Olami Y. and Gal Z. 2004. 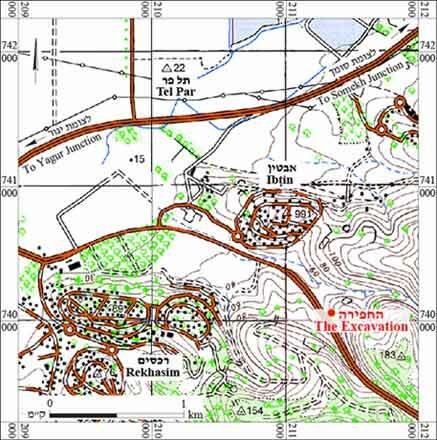 Map of Shefarʽam (24) (Archaeological Survey of Israel). Jerusalem. 5. Wall 120, looking west. 6. Wall 140, looking east.